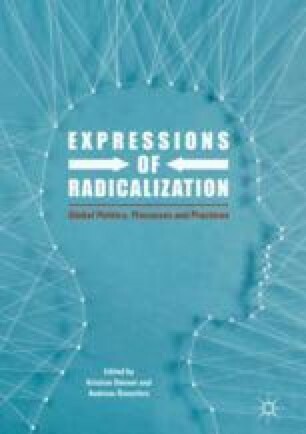 In their opening chapter, the authors survey contemporary secondary literature, which enables the authors to highlight conceptual ambiguities of the term ‘radicalization’, extract the main trends in research and the public discourse, and contrast them to each other, identifying gaps and proposing ways forward. One of their main arguments is that radicalization denotes a relative relationship to a reference point and that issues of observation and measurement need to be addressed in order to understand radicalization with a higher level of precision. Moving away from purely unidirectional and linear modes of explanation and combining a number of approaches, the authors propose a holistic model combining cognitive and behavioural processes and their interplay with a macro-level (of ideas), a meso-level (of support communities or adversaries), and a micro-level (of individual action).